Introduction: Robot-assisted surgeries are widely adaptable in various medical fields, such as urology, cardiothoracic surgery and gynecology. However, training programs using actual surgical robots are costly. The development of Virtual Reality (VR) training platform alternatively provides an inexpensive and user-friendly interface. The learning effect of VR training system and the capability of skill transfer from the VR to actual situation are still ambiguous. The purpose of this study is to use a portable and low-cost virtual simulator to determine whether the VR training effect is transferable to an actual performance using actual robot. Method: Four participants from the University of Nebraska Medical Center were randomly assigned to either the experimental (VR) group or the control group. Two fundamental surgical tasks, Bimanual Carrying (BC) and Peg Transfer (PT), were developed identically in both actual and virtual environments. In the VR group, participants completed two surgical tasks in the Da Vinci Surgical System (dVSS) (Intuitive Surgical, CA) before and after a VR training, in which participants were trained to practice both tasks in the VR environment. For the control group, participants completed the same procedures but practiced to maneuver two simulators in three-dimensional space in a PC video game. Kinematics of the dVSS surgical instrument tips (time to task completion and total distance travelled of the instrument tip of dominant side) were analyzed. The two-sample t-Test was used to analyze pre and post VR training effect. Results: A significant reduction in the time to task completion (p < 0.01) and total distance travelled (p < 0.05) in both BC and PT tasks were shown for the VR group after simulated surgical skills training. However, for control group, a significant decrement of time to task completion only revealed in BC task (p < 0.05) and no significant differences of total distance travelled of the instrument tip were found in both tasks. 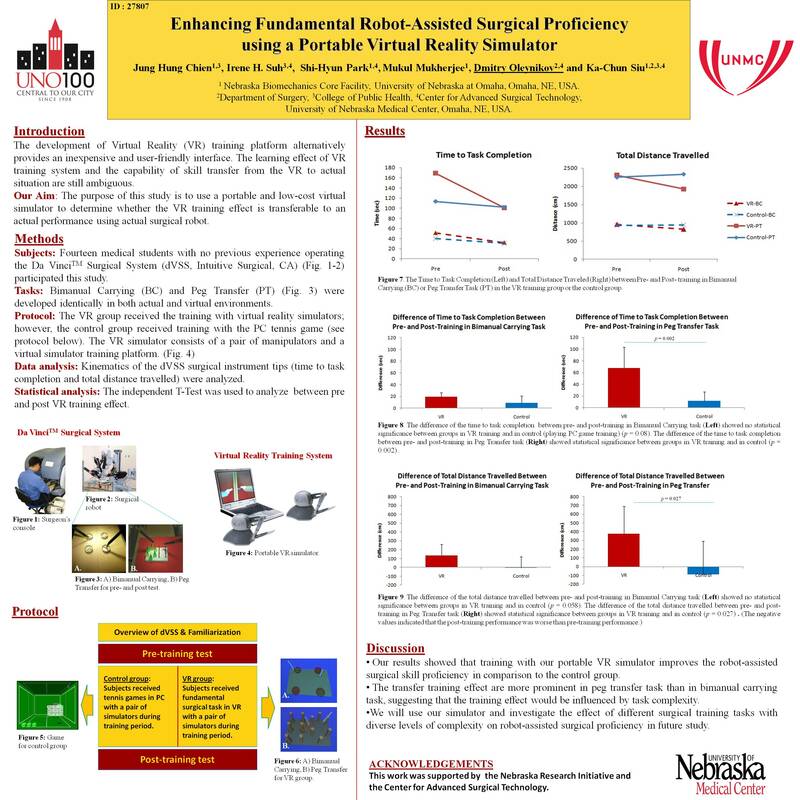 Conclusion: Our preliminary results showed that training with our custom portable virtual simulator improves the robot-assisted surgical proficiency. In addition, only training with simulated surgical tasks could transfer training effect to the actual performance in surgical robot. Further research with larger sample size is required to confirm our finding. Moreover, more complex VR modules have to be established to understand impact on different difficulty of surgical procedures.